Coming to Whitman, I of course expected to have small class sizes, with Whitman being a small Liberal Arts school. What I did not expect, however, was that I’d walk into my Latin class on the first day to find myself in a class with a grand enrollment of two. And, yes, one of the two is me. I can still recall clearly the amalgam of thoughts that went through my mind upon entering the classroom that first day: Where are the others? Did they get lost? They must have gotten lost. This can’t be it. The others must be on their way. I thus proceeded to inquire from my professor if the enrollment really is just me and Shannon. Professor Burgess then confirmed reality with a “Yes, it’s really just you two!” I tried my hardest to give the most genuine smile I could muster, accompanied by a somewhat strained “Yaaaay” as I stumbled into my chair. More thoughts came flooding through my head: How is this even going to work? What if Shannon drops? Should I drop too? What have I done? Where’s the closest exit? As class commenced, so did my relaxation process. I gradually became more and more comfortable with the idea of just two students being among a professor. Not only did I become more comfortable with it, I realized that I really enjoy it. For one hour, three times a week, Professor Burgess, Shannon, and I get to read and discuss something that we all have a true passion for: classical ancient texts. It’s so refreshing coming from a high school Latin class, where Latin wasn’t exactly the favorite amongst the students, and joining a new little environment where the passion for the language bounces off the walls. My professor speaks in such a manner that makes me want to love the Classics even more than I already do. 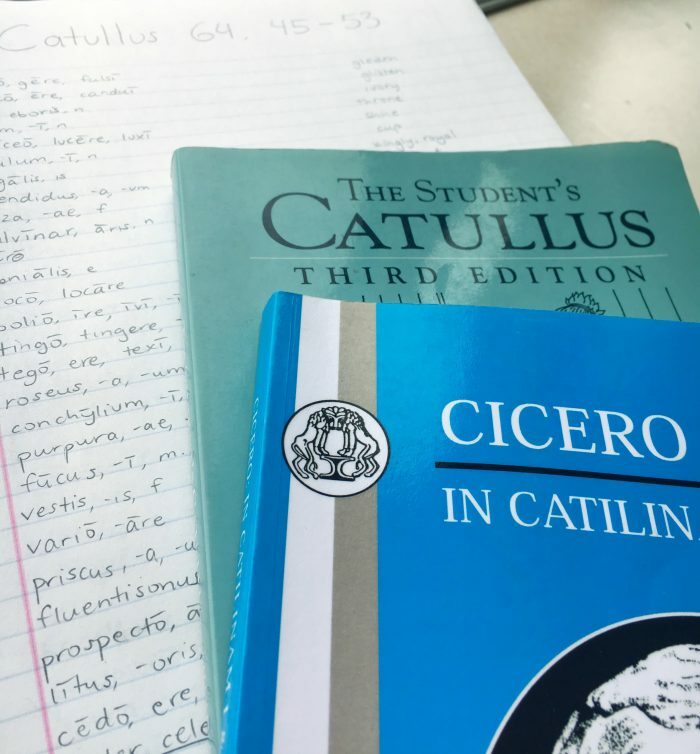 Being among only one other student was certainly intimidating at first, but after the first couple classes, Shannon and I settled into our efficient routine of switching off translating each sentence in Catullus’ 64th carmen. Line by line, we get through the chunk of text that we each prepare the night before, getting help from both each other and Professor Burgess. A fabulous thing about translating with others is getting to hear differing interpretations of a grammatical structure which you may not have thought about upon first read. Professor Burgess, Shannon, and I sometimes have differing opinions on the way a word or phrase ought to be translated, which we offer up and discuss; this discussion tends to end in either unanimous agreement, or two against one. From two against one, we dig deeper and make cases for our opinions and usually conclude with an “agreement to disagree” (with no hard feelings, of course). This entry was posted in Academics, School Year, Student Life.